Leslie HH, Fink G, Nsona H, Kruk M. (2016) Obstetric Facility Quality and Newborn Mortality in Malawi: A Cross-Sectional Study. PLoS Medicine, 13(10). Despite dramatic increases in women’s access to skilled birth attendants in the past two decades, neonatal mortality has declined slowly – deaths within 28 days of birth are now the largest share of global child mortality. Malawi, one of the poorest countries in the world, achieved dramatic reductions in child mortality and has recently reaffirmed its commitment to reducing neonatal mortality. We assessed the quality of facilities where women delivered to explore whether poor health facility quality might contribute to avoidable newborn deaths. 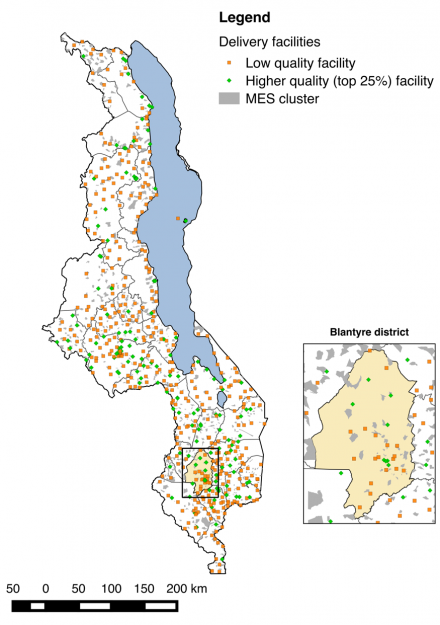 This analysis was made possible by a unique combination of surveys conducted in Malawi between 2012 and 2014: a household survey of maternal and child health and a detailed assessment of all health facilities in the country. We linked each birth reported in the household survey that occurred at a health facility (92% of all births) to the nearest facility of the type where the woman gave birth. We measured quality of delivery services using a 25-item index of infrastructure, supplies, routine clinical practices, and basic emergency procedures and classified the top 25% of delivery facilities as high quality. Access to facilities offering delivery services was high: median distance to the likely delivery facility was 6.0 kilometers. Quality of these facilities was low, however, with the average facility fulfilling only 63% of the basic quality index; women had to travel a median of 3.3 kilometers further to reach higher-quality care. Facilities were particularly unlikely to have ambulances, reliable power sources, functional heat and light sources. We used the relative proximity of women to higher quality facilities as an instrumental variable to overcome the selection of high-risk labors into higher quality referral facilities. The results indicate that access to high quality care is critical: the chance of newborn death increased with additional distance between any facility and a high quality facility. This analysis suggests that a large proportion of neonatal mortality in Malawi – as high as 23 deaths per 1,000 live births – might be avertable if higher quality care were accessible to women delivering in poorly equipped facilities. Expanding the availability of health facilities is only a first step in ensuring that women and newborns have access to essential health care for labor and delivery. Previous PostPrevious Researcher Todd Lewis: No ‘fluoride in the water’ for quality improvement?